Moving piles into empty spaces. 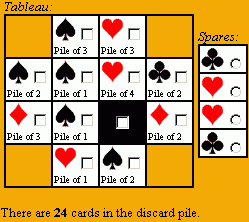 The black square represents a pile with no cards in it. What can you do with an empty pile? Well, one thing you can do is place a spare on it (just like on any other pile). Another thing is this. You can move any pile in the tableau to an adjacent empty space, just by sliding it across. 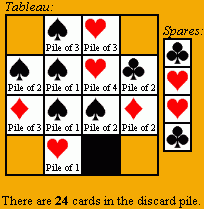 Piles can be adjacent in any of four directions (not diagonally) and of course you can't move them outside of the tableau. Such a move is a manipulation. We've almost finished - there is only one rule that I haven't explained yet. Earlier I explained what BLOCKS and CROSSES are useful for, but I haven't yet told you what's important about EXTREMITIES. 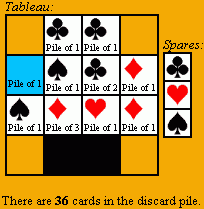 Well, suppose a given extremity contains one pile with cards, and one pile that's empty. In that case, you can pick up the top card from the pile with cards, and place it on the empty pile. This is a manipulation. That's all, folks. I've explained all of the rules now. Remember, you win when the discard pile contains all 52 cards. I encourage you to read through the example game for some useful strategy tips, but you may like to play the game a few times first.